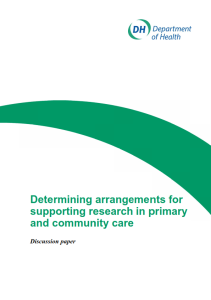 A discussion paper, Determining arrangements for supporting research in primary and community care, has been published. The paper aims to support local organisations, in collaboration with local networks, to consider how to achieve a smooth transfer of capability within the changing NHS for supporting primary and community care research. In future, independent contractors in primary care will decide of their own accord to participate in research, like other providers in acute, community and mental health care, though they will likely need advice in taking this decision. Clinical commissioning groups, which have legal duties to promote research and the use of evidence to support commissioning, may also wish to seek advice and support in these roles. Local health communities, in planning how functions are transferring between organisations as part of the transition, will wish to review any locally based primary care trust research services. They are encouraged to consider retaining and finding a suitable host for skilled teams that can offer supportive services to primary care providers and to NHS commissioners with their future duties and activities. Care and Support Minister Norman Lamb today announced that 6 local projects have begun work to help improve access to psychological therapies for those with severe mental illnesses. Work will include demonstrating how people with severe mental illness and personality disorder can get better access to psychological therapies sharing good practice to other services and sharing how improvements in services can be made providing good quality data on how services can be improved for patients and identifying the clinical, non-clinical and economic benefits. A new scheme that could improve the care and treatment of people with severe mental illnesses, such as schizophrenia and psychosis, was announced today by Health Minister, Norman Lamb. An estimated 1.8 million people are affected with severe mental illness and these pioneering schemes will address new ways of treating patients including reducing medication, where appropriate. The NHS East of England Dementia Lead, Dr Sarah Robinson has produced the November 2012 bulletin of the Dementia Strategy providing information and links on Dementia news. Dame Sally Davies has published her first annual report of England’s health. To view the report please see the Department of Health website. 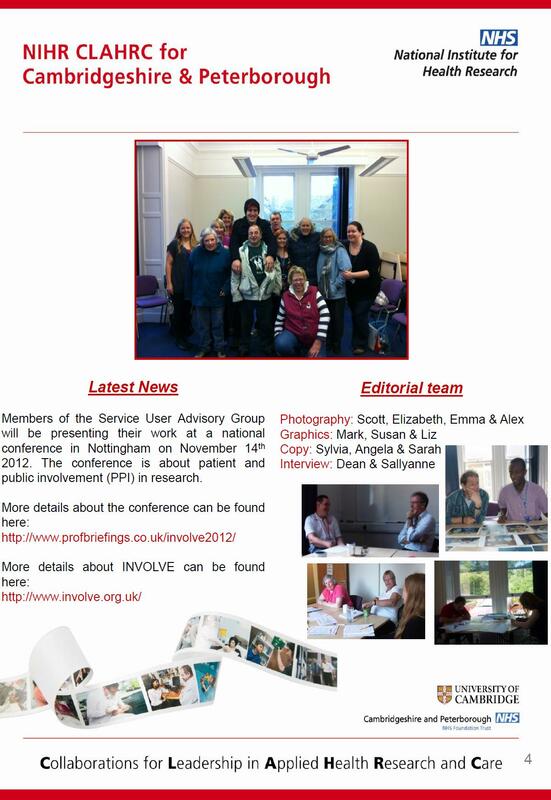 Service user advisers and researchers from the CLAHRC CP Adult Theme Service User Advisory Group (SUAG) have been working together over the past two years as part of a study looking at how integrated community-based specialist teams can best support people with intellectual disabilities and complex and enduring needs. As well as making a direct input to the research design, the advisers have also given the researchers a different insight into the realities of the lives of people with learning disabilities. 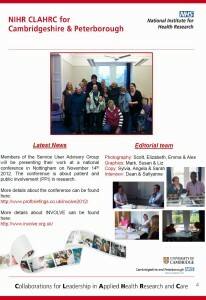 The group jointly presented at the NIHR INVOLVE conference on 14 November about “Our journey together”. An interactive and lively session demonstrated examples of the group’s activities, for example how they had explored visual methodologies by taking photographs of their lives. Workshop feedback showed how the use of film clips, contrasting a service user’s perspective with their carer’s views, made a big impact on the audience. Presenting at this national conference was a great achievement for the service user advisers and at the end of the session they were surprised and delighted to be invited to talk about their work elsewhere. For more information please see the SUAG newsletter.